*Finance to approved consumer applicants on a secured fixed rate loan product. Finance is under a consumer fixed rate loan with a maximum 48 month term. 10% deposit required. †4.99% P.A. Comparison Rate is based on a 5 year secured consumer fixed rate loan of $30,000. WARNING: This comparison rate is true only for the examples given and may not include all fees and charges. Different terms, fees or other loan amounts might result in a different comparison rate. Credit criteria, fees, charges and terms and conditions apply. Standard Lending criteria applies. Terms and conditions available on request. Subject to suitability. Harley-Davidson Finance is a registered brand name of Harley-Davidson Financial Services International, Inc. and is operated under sub-licence by St.George Bank – A Division of Westpac Banking Corporation ABN 33 007 457 141 AFSL and Australian credit license 233714. Offer available 3 April 2018 and expires on 31 May 2018. Applications must be submitted and approved by 31 May 2018 and vehicles must be delivered by 15th June 2018. 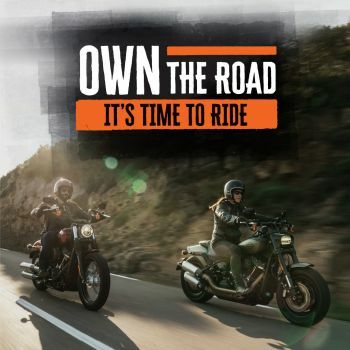 Offer available on selected Street, Sportster® and Softail® model Harley-Davidson® Motorcycles. Offer excludes Touring, CVO’s™, Trike and Anniversary models. While stocks last. Cannot be used in conjunction with any other offer. © H-D 2018. Harley, Harley-Davidson and the Bar & Shield logo are among the trademarks of H-D U.S.A., LLC.